Chris Paterson will leave Gloucester at the end of the season to return to Edinburgh after just one season with the Guinness Premiership side. The 30-year-old, who has been capped 86 times by Scotland, has been restricted to 17 appearances this season after his summer move south of the border. 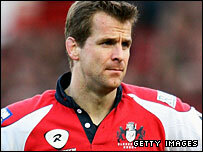 "I feel as if my one year at Gloucester has made me a more knowledgeable player," said Paterson. "I have learned so much and have been fortunate to work with good coaches." "I think when I've been on the field I've performed pretty well." The versatile back scored four penalties as Scotland beat England in this year's Six Nations and he also had 100% kicking record at last year's World Cup, but he has failed to make an impact at Kingsholm. "Chris has been an outstanding professional both on and off the field since joining us after the World Cup and we wish him every success with this move," said Gloucester's head coach Dean Ryan. "Though his starting opportunities have been limited, his dedication and versatility have been very influential within the squad." Edinburgh head coach Andy Robinson is delighted to have secured Paterson's services for next season and added: "We want to compete at the highest level and to achieve that objective we have to have a world-class goal kicker. "Unquestionably Mossy (as Chris is known) is a world-class goal kicker. "We're signing him to compete for a place in two positions - full-back and stand-off. "Having spoken with him I've been struck by his real desire to play for Edinburgh and with a player of his status available it increases our options to rotate our squad."